I’m so exhausted that I kind of want to just drop a ton of photos here and go take a nap. But I love y’all so I won’t do that. If you have no idea what I’m talking about, let me catch you up. 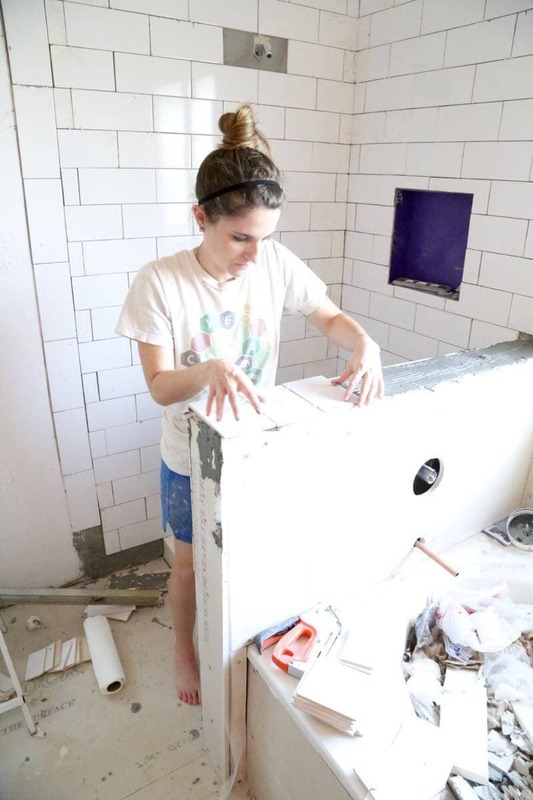 Corey and I are currently participating in the One Room Challenge (a design challenge where bloggers tackle a room renovation in 6 weeks) and we gutted our master bathroom and have been rebuilding it basically from the studs up. This is week three (halfway done already? WHAT?) and we’ve finished tiling the room. 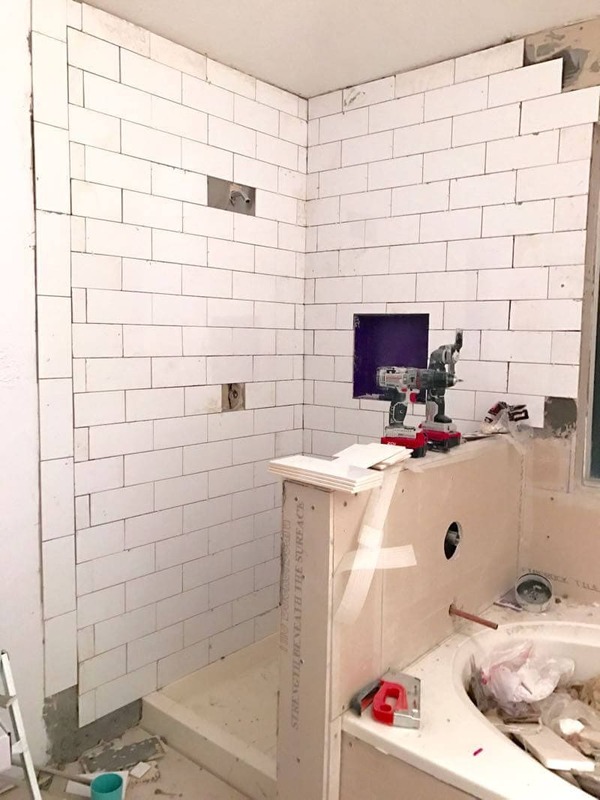 We hadn’t ever done a tiling project prior to this, and for some reason we decided that our first tiling job should be about 200 square feet of corners, cuts, and ridiculousness. I totally acknowledge that we’re crazy, but we survived and the tile is installed and grouted. We still have some clean up to do, particularly on the corners and around the edges, and we still need to go back and caulk. The shower niche needs some major cleaning up, but everything else is donezo. 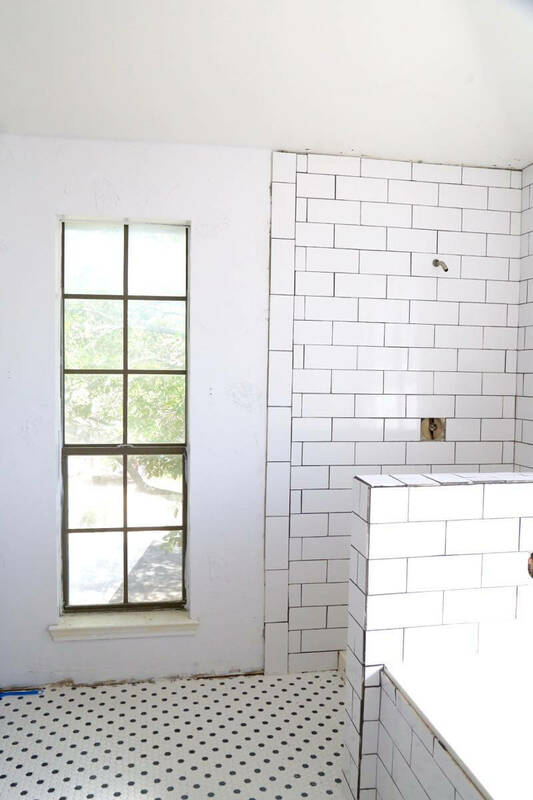 You might remember that Floor & Decor is one of our (amazing) sponsors for this challenge, and they were kind enough to provide the tile for this makeover. I chatted about our visit to the store and our process for choosing the tile last week, and it feels so good to have it all done. I cannot believe we completed all of this work in one week, while working full time jobs and parenting a toddler. Have I mentioned that I’m exhausted yet? I have a full tiling tutorial planned in a few weeks (we did this job mostly in the evenings so pictures were practically impossible. 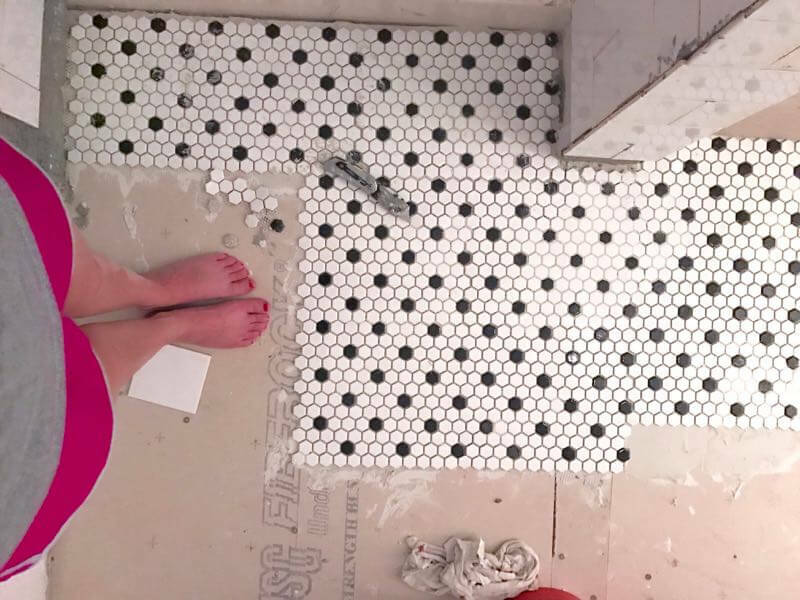 I’m going to share our process and tons of tips for tiling once we tackle the backsplash for the vanity area) but today I do have a few reflections on our first tiling experience and a few in-progress photos! Install cement backer board if you’re working in a bathroom or wet area (I chatted about that here). 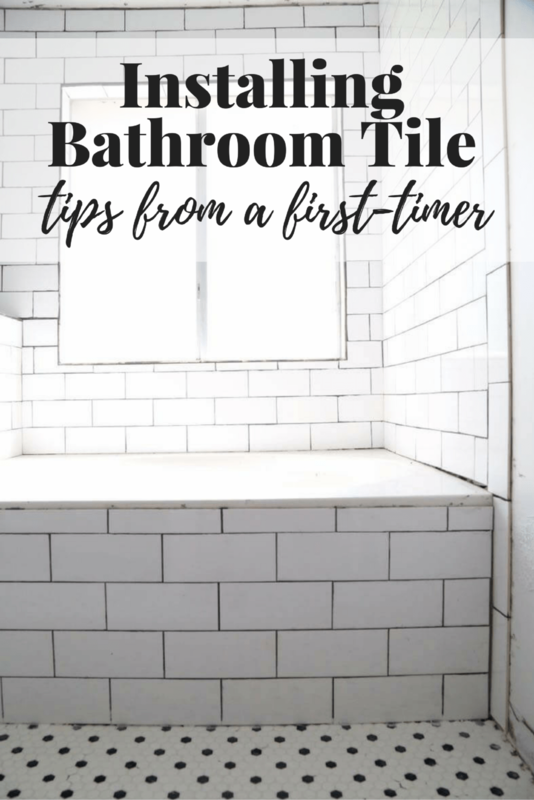 Spread thinset on the area you plan to tile – don’t work on too much at a time, or it’ll start to dry before you can tile. 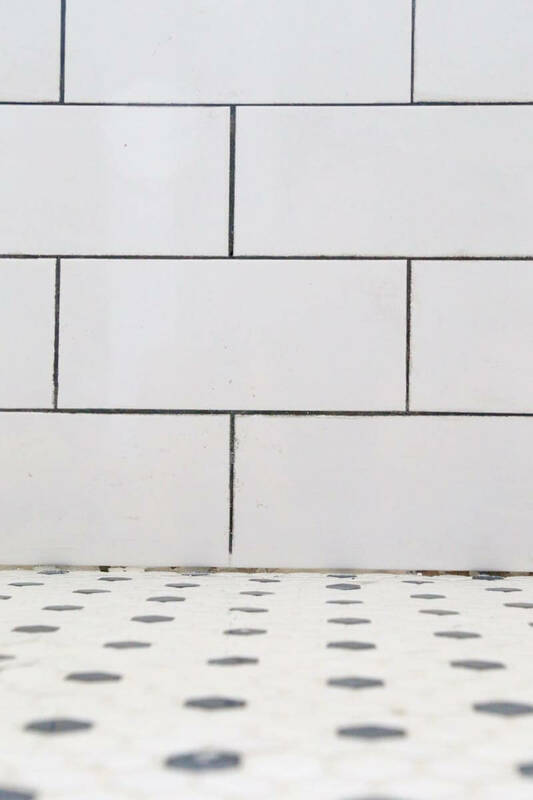 Install tile – use spacers to help you keep your grout lines even. Allow to dry for the recommended amount of time – for us, this was 24 hours. Clean up the tile if necessary, be sure that there isn’t any thinset poking through the ground lines. Grout! The cleanup of grout is the most tedious (and most important) part. You should clean up the extra grout about 5-10 minutes after adding it, then go back about an hour later for a final cleaning. One thing we learned pretty quickly is that tiling is a messy, messy job and that it takes a lot longer than I expected. We also learned about the importance of prep work and cleaning as you go. 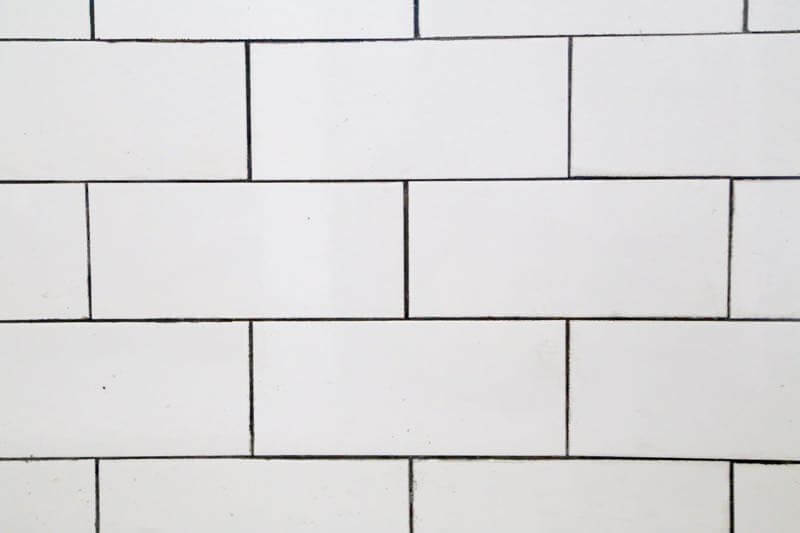 I’m not admitting to anything but there’s a possibility that I had to spend approximately 5 hours scraping each individual subway tile because I didn’t properly clean after I grouted. That’s just an example. It didn’t actually happen. We worked on this project in the margins of our regular life, which meant every night we started work at around 7:30 after Jackson went down and didn’t stop until at least 10:30. A few nights I was up past midnight working. It was insane and entirely too much work and have I mentioned that I’m so glad it’s done?! It is so rewarding to have this part of the project done, and I am head over heels in love with this tile. The whole room looks so different now. It’s all coming together, my friends! Do you ever have that problem where you spend so much time working on and scrutinizing a project and then once it’s done all you can notice are the flaws and things you still need to finish? Yeah, that’s where I am with this project. I have spent hours upon hours staring at it, getting frustrated by it, and dropping crazy amounts of blood, sweat, and tears into this tile and now that it’s all over I have a hard time looking past the minor issues or things that still need to be finished up. 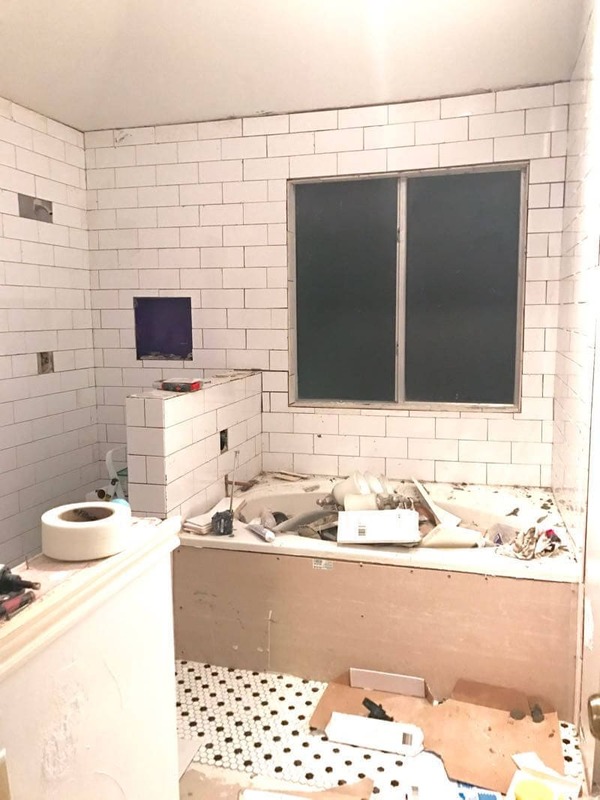 I’m definitely antsy to get back in there and grout and do some more cleaning up – I feel like that last 5% makes a giant difference in a project like this. Next up on the agenda is a ceiling treatment that’s going to blow your mind (we haven’t started on it yet, but I’m crossing my fingers it’ll be done and ready to share next week! ), installing baseboards and painting the trim, giving the vanity area a major overhaul, installing a DIY light fixture (that we also haven’t started on yet but have all planned out in our head), and adding in the fun, pretty finishing touches. Basically, there’s still a lot to do. And we have three weeks. 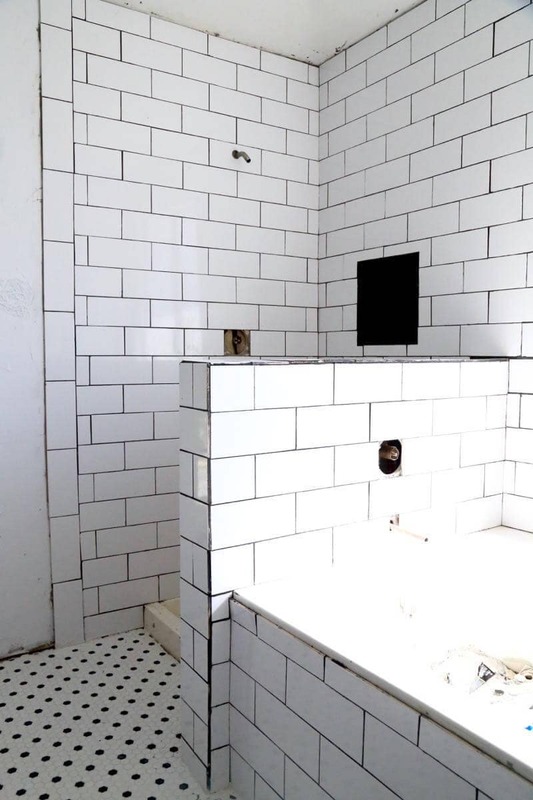 Need to catch up on our bathroom renovation? Have you ever installed tile before? The tile looks great and love the combination! I’ve never done a tiling project and hope to someday! It’s looking so good! 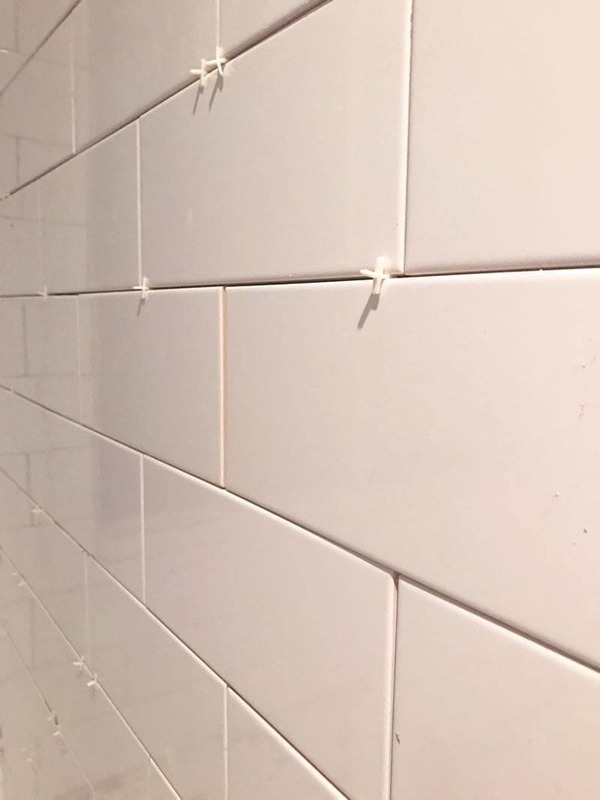 I bet your soo excited to have the tile part done. This is looking so great. Love that tile. It’s looking so great Amanda! Great job on the tile, it’s amazing! The tile work in this bathroom is amazing! I know it is so much work, but it is going to be beautiful all finished! You are halfway there, you got this! WOW!!! I can’t believe you did all of that in one week! You guys are rock stars, can’t wait to see the finished room, it looks great! Oh my gosh, it looks SOOO GOOD!! 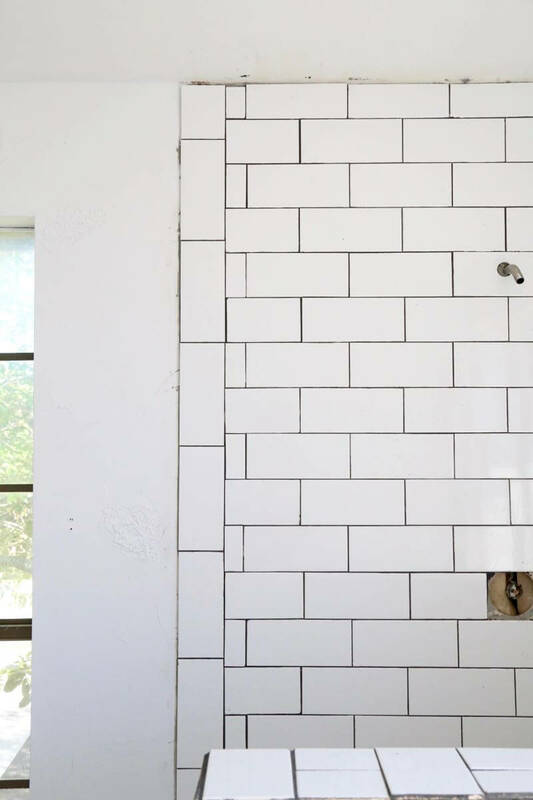 I just love white subway tile, and that floor!! How exciting! I don’t blame you for being tired! What beautiful work!! You deserve a little break! Can’t wait to see the finished room! Girl, I’m exhausted! Now that we’ve finished the bulk of the major projects I can’t bring myself to get the energy to finish the little ones! The tile looks amazing, I really love that floor. Now I can’t wait to see what it is you’re going to do on the ceiling! Holy Mackerel Amanda, and I thought I had it rough doing my stencil wall! You surely win the ‘Yeah, i tackled a crazy hard project and rocked it’ award! It looks fantastic and can’t wait to see it all cleaned up. Well done…hope you are enjoying your weekend a bit and have a time to relax…maybe just a wee bit. Oh you’re too kind! We did bite off a bit more than we should have! 🙂 We’ll get there, I’m sure! These are the same tiles I want in our bathroom! (almost). Looks amazing so far!! You guys made great progress this week! The tile looks amazing. 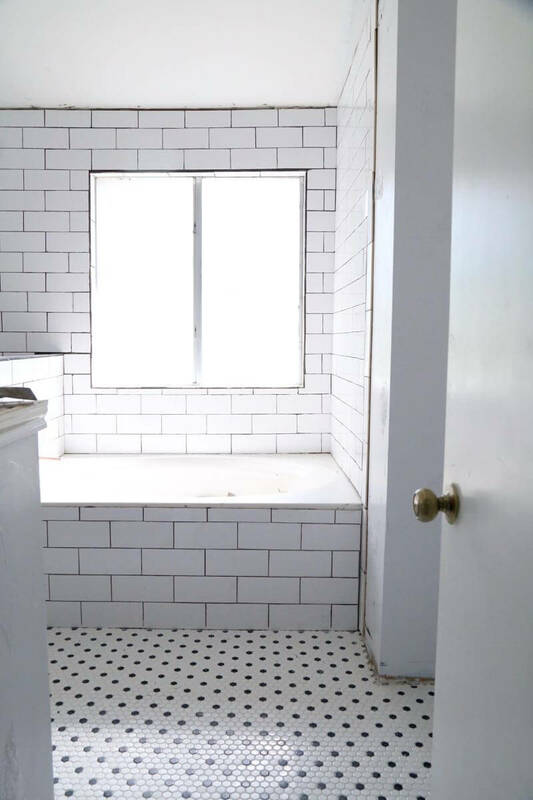 our master bath is in major need of a renovation as well! .. It’s going to be so lovely! I can’t wait to see the reveal! I love the look of the tiles going all the way up the wall. Amanda, this looks ahhhhhh-mazing!!! You need to give yourself more credit! 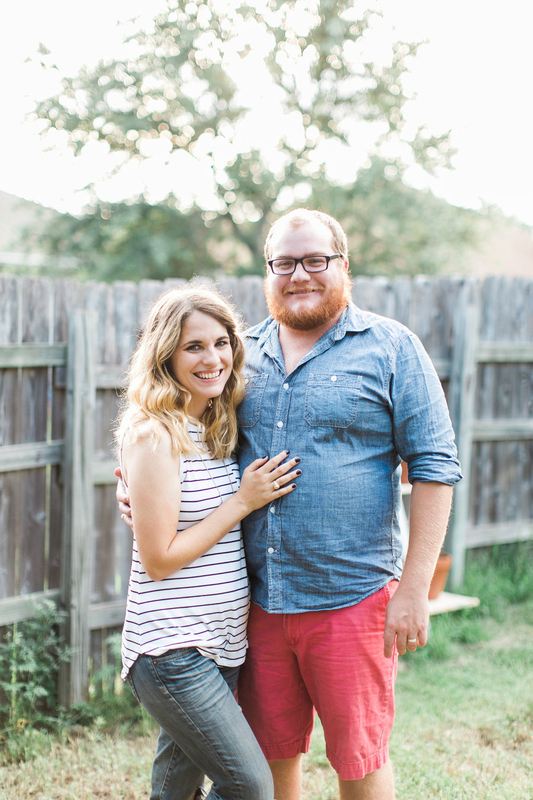 You and Corey did an incredible job! And the change it already makes is huge! But I know what you mean; after you’ve spent so much time poring over it, it’s hard to see past the mistakes you know you made; we’ve had a few of these moments with our bench building project so far. Wow, I bet you are exhausted. Great job and it is really coming together! We will be doing a huge tile job next year in the bathroom. Pinning because we will need all the help we can get! Oh my word! It looks amazing!! That is a lot of tile though. We’ve tiled before and it is exhausting and never ending. It already looks great, can’t wait to see the rest! that’s a ton of tiling! 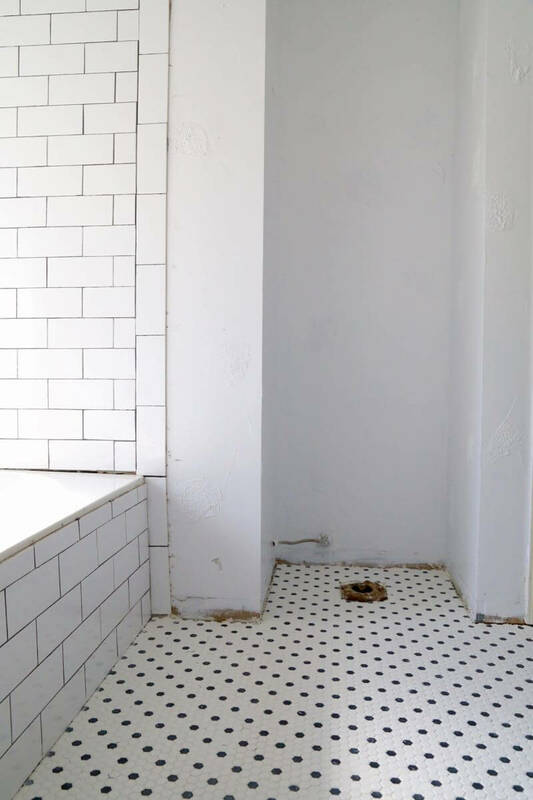 Love the tile choices and can’t wait to see it all cleaned up! Ok for your first ever tile job this looks amazing!! Don’t be so critical! Once you go back and clean it up it’s going to look amazing! Sending you a virtual bottle of wine (or two) because you totally deserve it! Thanks, friend! I’m SO excited to get everything patched and caulked, it’ll make a big difference! I love the black grout! Wow you have been very busy! 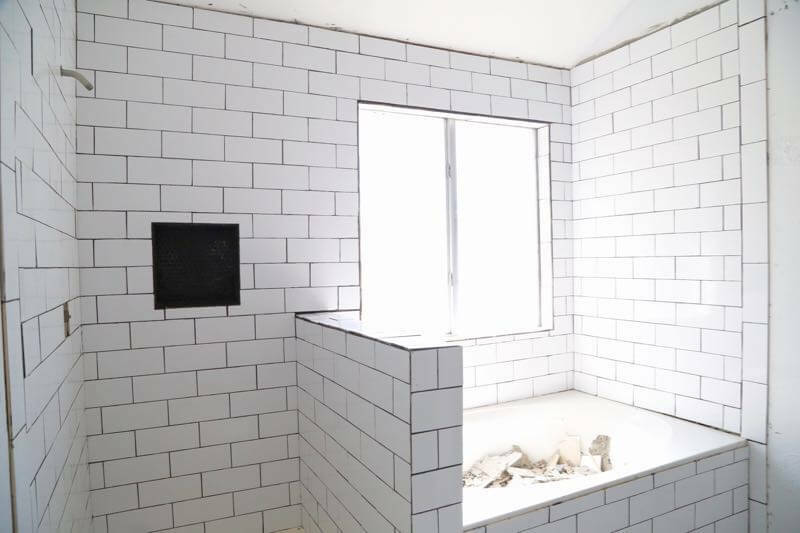 This bathroom is going to be amazing, can’t wait to see it. That’s amazing progress, Amanda! The floor tie is perfect. Your space is going to be absolutely stunning! This was ambitious to say the least, but I think you guys will come out on top! We’re kind of at this stage with the wingback chair upholstery. It’s like 95% done, and that last 5% will make all the difference. That tile though! To die for! I love the tile on your floors, it’s perfection. Girl you have gotten a ton of tile laid since last week! Love that floor tile! The whole room looks so different with the lighter brighter tile. Thank you! It feels SO much brighter and bigger now! You should be so proud of yourself, the tile project looks fantastic, great job, I know the last ORC I got sick from exhaustion and linking up is tough too, Stay strong. Omg, Amanda! I feel your pain. Renovations are no joke especially when you’re doing all the tiling! Kudos to you and your hubby on getting that huge job done (looks great)! Can’t wait to see the whole thing come together! Wow Wow Wow! We are super impressed with your DIY skills. The tile is gorgeous and you did a fabulous job! You should be so proud! Loving your classic choices! I can’t wait to see it all come together! Kudos to you for jumping in and tackling this yourself! I hear you, I am such a perfectionist. 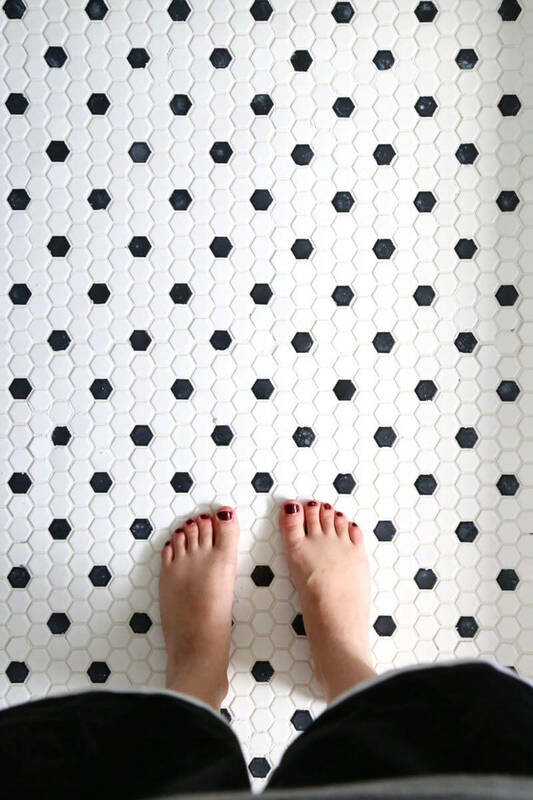 I don’t know if I would be able to tile. Plus I have zero experience with it. I’d probably lose my mind. I can’t wait to see the progress next week! Thanks, Brittany – it’s definitely not an easy job, haha.